Even though smartphones and computing devices are being adopted quicker than ever before, there are still some rather significant gaps in access to the internet across developed and developing economies globally. According to the Cisco VNI Global IP Traffic Forecast 2014-2019, adoption of connected devices in the Asia-Pacific is happening at a much slower rate than in the North American, West European and Central European regions, but it is expected that there will be 2.5 devices per person in 2019, which is still an improvement from 1.6 devices per person in 2014. 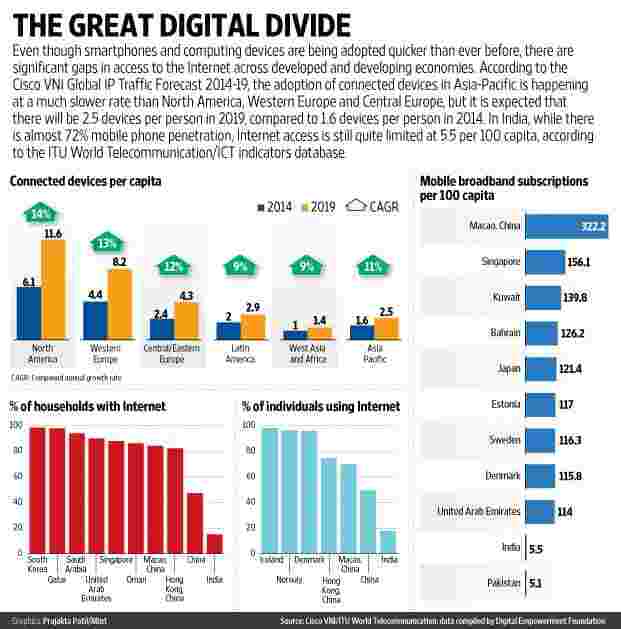 In India, while there is almost 72% mobile phone penetration, internet access is still quite limited at 5.5 per 100 capita, according to the ITU World Telecommunication/ICT indicators database.